When the 1979 Book of Common Prayer first came out (or when I became conscious of it, anyway, having grown up with the “Green Book” and the “Zebra Book” before it) I memorized the page numbers of the Baptismal Covenant. It spoke to me and my spiritual journey. 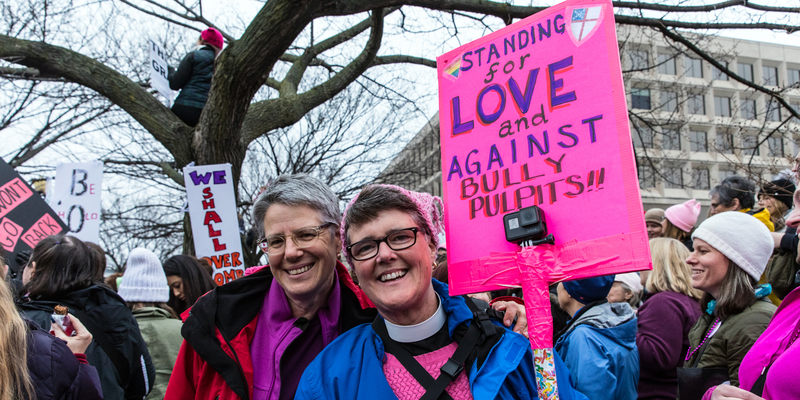 It later came in handy when I could refer to it on my ordination exams, and it was useful last week when a reporter asked me why I was going to Washington to participate in the Women’s March. To “strive for justice and peace among all people, and respect the dignity of every human being” is what I have been trying to do all of my life, and marching–praying with one’s feet– is one way to do that. Apparently I’m not alone. Sign after sign that people carried in marches all over the US last Saturday, and that I saw pictures of on my Facebook feed during the March on Washington for Women, referenced these words of the Baptismal Covenant. My vocation has been nurtured at the feet of what I would call “holy resistance”. My faith has been formed by finding the intersection between what Jesus did in the lives of those considered the ‘lowest’ 2000 years ago and what we can do now. So I march. It’s part of my stewardship of my life as a person of faith. And it’s part of my prayer life. “Praying with my feet” started for me with the movement to ordain women, when I was in high school in the 1970’s, attending meetings of the Episcopal Women’s Caucus. It continued with Anti-Apartheid rallies, Draft resistance demonstrations and LGBT marches in college (my first march in Washington was the 1979 March for Lesbian and Gay Rights). And it all comes back to my baptism. When there is injustice in the world—- something inconsistent with the values espoused by Jesus—- I will use all of the resources I have to oppose it, whether it is prayer, using my financial resources carefully and creatively, speaking up, writing letters, marching, or more. I marched in Washington to protest the lack of dignity given to so many human beings by our incoming president. For me, marching was about my baptism. And it was a prayer.